Pharmaceutical company specializing in softgel technology in Highpoint, NC. Company wanted to transfer powdered material from multiple drums into a flexible IBC (ILC DoverPac) and then deliver the product into a mixer for processing. The entire process needed to be accomplished with high containment (1-10 micrograms). IEDCO provided a custom drum handling system that lifted and tilted drums 90 degrees into a discharging position adjacent to the side of a custom isolator. The glove box isolator allowed an operator to access the inner liner of each drum and empty its contents into the flexible IBC on a scale system below. A custom frame, scale system, and transfer cart was created to hold the flexible IBC during the filling process and allow it to be removed and transported to the mixer for final discharging. This unique drum handling system allowed the customer to empty drums and fill flexible IBCs with extremely high containment and the utmost in operator safety. 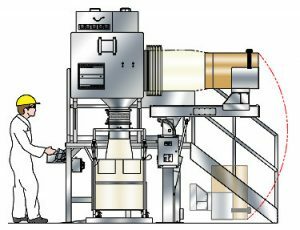 International pharmaceutical developer and manufacturer in Petersburg, VA.
Company needed to accurately batch powder from bulk bags into a reactor in one process, as well as have the ability to accurately fill bulk bags or drums with powdered product from dryers in another part of their facility. Both areas environmentally classified as Class I, Div II. For the bulk bag unloading process, IEDCO provided a unique bulk bag unloader to be installed in the room above the reactor to be fed. The product was metered from the bulk bags via a sanitary rotary valve through a chute system in the floor. The bulk bag unloader had integrated load cells which allowed for creating accurate loss-in-weight batches to the reactor. 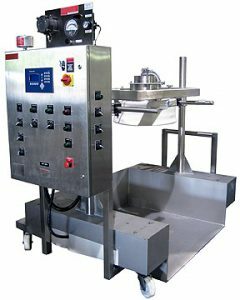 For the filling process, IEDCO provided four “zero lift” style pack-out units with individualized features and fill heads to allow for bulk bag filling or drum filling. The fill heads were also fit with a sieving system to refine the powder from the dryer. The pack-out units were designed to accept empty bulk bags or drums on pallets using a simple pallet jack – no forklift needed. Integrated with weigh modules, the pack-out units produced accurately weighed batches in either container. All equipment supplied complied with the necessary specifications to operate in Class I, Div II environments. All the systems provided streamlined existing practices and increased overall process efficiency. By introducing the LIW bulk bag unloader above the reactor process, IEDCO eliminated the need for additional material transfer equipment. The pack-out units were designed for flexibility, ease of use, and safety. All systems offered complete contained transfers of the powdered materials, as well as accurately metered batches. International pharmaceutical manufacturer in Mt. Vernon, IN. Company needed to discharge 20 liter poly-bottles containing either API or non-API powders into multiple mix tanks with inlets approximately 10’ above the floor. Material transfer needed to be ergonomically safe and contained (especially for the API powder solution). IEDCO provided four pneumatic column lifts with custom designed lift effectors to handle the specialized poly-bottles. The lifts were able to lift, invert, slew, and dock the poly-bottles to the mix tanks. The API solution bottles and corresponding mix tank inlets were fit with split butterfly valves to ensure contained transfer of the active powder. The API bottles also needed to be rinsed with water and emptied back into the mix tank, again in a contained and safe manner. Lift controls were located on a pendant device, allowing a single operator to load the poly-bottles at ground level and then dock the bottles on a mezzanine adjacent to the mix tank inlet. The new poly-bottle lift and discharge systems allowed a single operator to discharge the powdered solutions in the 20 liter poly-bottles into the required mix tanks in a safe, ergonomic, and contained manner.